CELEBRITY APPRENTICE: It’s Finally Back! Last night, NBC premiered the fourth installment of “The Celebrity Apprentice” with a two hour show. After a long wait, after much hype and buzz from a countless number of network promos, after sitting through a disappointing celeb drama-less previous season, finally “The Celebrity Apprentice” made a rebound in last night’s show! It’s back to the way it was meant to be! The fun started when La Toya Jackson couldn’t remember what the newly formed women’s team acronym name A.S.A.P. stood for. The men’s team responded that they were not threatened because the women were already confused. During the pressure of servicing a long line of pizza orders, project manager Star Jones tried to take over Dionne Warwick’s post at the register. That didn’t go over so well as Warwick insisted that she was very capable. Besides, who cares if she takes a bit longer, Warwick was confident that the customers would wait. Aside from collecting funds at the register, Jones’ money-raising efforts paid off with a near $200,000 victory over the men! The best was definitely last when the fireworks imploded during the first board room firing where the men’s team project manager Richard Hatch had David Cassidy and Jose Canseco join him on the chopping block. The tension started even before that when Trump asked each team to disclose their opinions about team mates. Cansesco attested to his distaste for Richard Hatch. So, no surprise he was brought into the boardroom with Hatch. In the board room, David Cassidy was repeatedly attacked by bully Hatch who called Cassidy “a little person” and referred to him as being “delicate” emotionally in response to his denial of shoving Cassidy out of the way during a discussion about their pizza-making task. My question is – since it’s a reality show, can’t they just re-play the tape? Argument resolved. But, then there wouldn’t be drama! Right! Last week during a media conference call with Hollywood Junket, Meatloaf said that he grew to like Hatch after getting to know him. So, far, I can’t imagine that happening under any circumstances. Also, in the same conference call, Trump said that Canseco, in addition to being a smart guy, is a very physical guy. 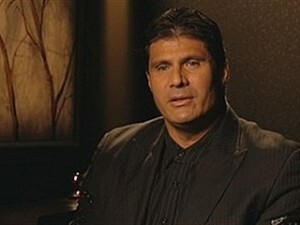 Canseco hinted to that side of himself in last night’s episode when he admitted to wanting to kick “Hatch”s a@#! A very revealing moment in Canseco’s character came about while seated outside the board room with Hatch. A steamed Canseco told Hatch that he should never underestimate his intelligence in response to an earlier comment Hatch made about not thinking Canseco to be very smart. During the team’s first charity fund-raising challenge, Canseco pointed-out that the act of raising money is more difficult for him in that he turned a lot of wealthy colleagues against him by writing his baseball steroid-use tell-all book. Let’s hope his brother Ozzy will come-through for him! It looks like audiences are in for a well-deserved treat with this refreshing explosive ensemble group of celebrities in this season of “The Celebrity Apprentice”.